One lucky social media follower of NU Hotel Brooklyn will get the opportunity to be a hero, just for two days. The hotel recently unveiled a new in-room David Bowie-inspired mural as the latest addition to its NU Perspective mural program and is now offering a two-night stay and VIP tickets to the exhibit to one lucky guest in its Hero Giveaway, open for entry through May 31, 2018. Designed by local artist John Fisk, the mural ‘Heroes’ was inspired by the current David Bowie is exhibit at NU Hotel is the preferred hotel and official sponsor of the groundbreaking exhibit at Brooklyn Museum which runs through July 15, 2018. The NU Perspective Program, launched in 2012, gives creative license to local artists to liven up the walls of 16 of the hotel’s 93 guestrooms. The hotel’s loft-like accommodations with crisp white walls are an ideal canvas for local artists to display their talent. 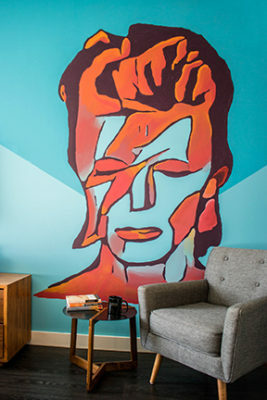 The latest mural created by Brooklyn-based artist and designer, and longtime Bowie fan, John Fisk, features a larger-than-life mural of Bowie in a king guestroom. The mural depicts a bust of Bowie brought to life with bright pops of orange, red and deep purple on a soothing aqua backdrop. Known for his work as a logo designer, Fisk’s designs have been featured in Graphis Book 5, Really Good Logos Explained and Creativity 36. An active member of the Brooklyn art collective, Gowanus Swim Society, Fisk has been showing his work locally for the last few years. NU Hotel Brooklyn is a 93-room environmentally conscious boutique hotel, located at the intersection of four great Brooklyn neighborhoods: Downtown Brooklyn, Boerum Hill, Cobble Hill and Carroll Gardens. Offering luxury amenities and exceptional service, NU Hotel Brooklyn draws inspiration from the creative energy of the borough’s thriving art scene and the urban dynamism that defines the neighborhood. Owned by Hersha Hospitality Trust (NYSE: HT) and managed by HHM, formerly known as Hersha Hospitality Management. HHM, formerly known as Hersha Hospitality Management, operates nearly 130 hotels across the United States. It provides turnkey hotel management, asset management and receivership for properties with leading 4 brand affiliations through Marriott, Hilton, Hyatt and Intercontinental Hotel Group. HHM also operates 28 independent hotels ranging from The Rittenhouse Hotel, a Forbes Four-Star property in Philadelphia, to the Larkspur Landing hotels, all-suite extended stay properties in Northern California and the Pacific Northwest. Its highly experienced team is accustomed to serving as a fiduciary to publicly traded companies, joint ventures, institutional real estate owners and private investors. Additional information on HHM can be found at hhmhospitality.com.